If you have ever used dull scissors to cut papers, you know how frustrating it can be. Regardless of the force, you apply on the dull scissors; it is not possible to make accurate cuts. Because of the frustration, most of us tend to throw the scissors away and get a new pair. This is the same when it comes to using dull chainsaws. The only difference is that you cannot afford to throw away a chainsaw every time it gets dull. This is where a chainsaw sharpener comes in. With the best chainsaw sharpener, you fix the dull chain and make your chainsaw as good as new. 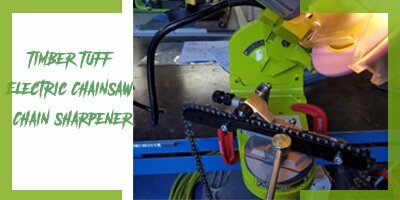 Instead of purchasing a chain every time, your chainsaw becomes dull or taking it to an expert to sharpen it for you, we are going to guide you on how you can do it on your own. This will save you a lot of time and money, not to mention the frustration that comes with working with a dull machine. 1.33 ​How do you sharpen a Chainsaw? 1.34 How does a Chainsaw Sharpener Work? To assist you in making a more informed decision, look at the following reviews of the top selling models on the market. This chainsaw sharpener will is a great tool that helps to get the blade of your chainsaw into the best working condition in no time. This sharpener is easy to use and energy efficient. The chain remains attached to your chainsaw and the sharpener clamps on the bar, allowing you to pull the chain as you sharpen each tooth. The sharpener doesn’t remove much material on the chain, so you do not have to worry about the teeth becoming weak. Moreover, this portable sharpener is easy to carry along to keep your machine sharp all the time. If you are considering of purchasing a portable chainsaw sharpener, this is an excellent choice. It is a perfect choice for anyone looking for an everyday tool to keep their chainsaws sharp. This tool features a two in one filing guide that which performs two functions at the same time. It controls the depth gauges while still sharpening both sides of the saw teeth. 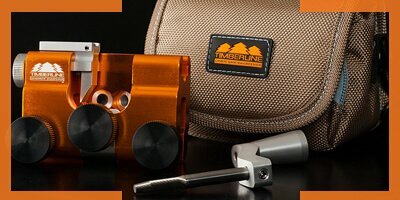 For ease of use, the tool also has guide handles and bars that allows for angled precision. Similarly, its lightweight yet compact design makes it convenient to carry around. This sharpener offers you with superb performance when it comes to keeping your chainsaw in optimum condition. 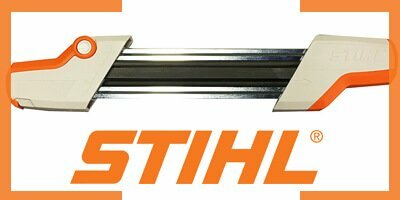 Proudly made in the United States, this unit boasts of accuracy and durability you can depend on. This is a professional grade sharpener integrates advanced features that allows you t to set the file height as well as the tooth length. We also love the sturdy yet lightweight construction materials for enhanced durability while remaining easy to carry a long. Besides, to make it easy to use, the unit has calibrated swivel guide marking that allows the user to set the correct sharpening angles. If you have ever tried to use a dull chainsaw, then you probably know how tiring and inconveniencing it can be especially when trying to cut large pieces of wood. 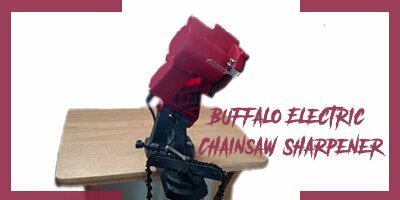 However, with the Buffalo ECSS chainsaw sharpener, it is easy to get the proper edge and angle on each tooth without having to remove the chain from the saw. This electric sharpener matches the chain angles perfectly, sharpening each tooth with precision for a razor sharp blade. What is even astounding about this tool is that it adjusts to fit most chain designs. 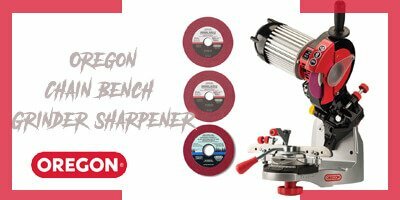 If you have been having trouble with your chainsaw, purchasing this best chainsaw sharpener from Oregon will give it the sharpness it once had when you purchased it. 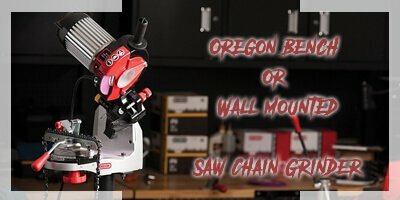 This is a wall/bench mount chain grinder designed for people who are looking for an effective chainsaw sharpener to use in their workshop. 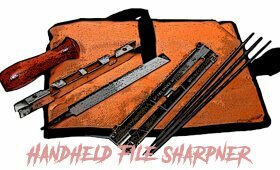 This sharpening kit has a variety of tools that allow you to keep your chainsaw in top condition. These tools include a dressing brick, a quick check grinding template as well as three grinding wheels that sharpens 0.25 inch, 0.325inch low profile chain and the 3/8 inch pitch chain. This newly patented chainsaw sharpener takes accuracy and precision to a completely new level. The manufacturer uses aluminum materials to come up with a tool that is not only lightweight but also durable. It has high praises in terms of handiness and efficiency. This sharpener portable and durable sharpener will allow you to sharpen various chains including the 3/8 and 0.404 pitch chain. This makes it a perfect choice for professionals who have more than one chainsaw. Additionally, it’s simple setup and ease of use allows users to get professional results. You can now keep your best chainsaw sharp all the time with this all-around electric sharpener. Unlike other models on the market, this unit features an inbuilt light that offers you with accurate and precise angles sharpening when sharpening various chain types. We also love the extra wide chain cutter and aluminum casing that plays a major role to prevent splashing of the iron filings. Another feature that makes this unit to stand out is the adjustable grinding angle that you can adjust between 0 to 30 degrees. On the other hand, you can adjust the motor from zero to 70 degrees to accommodate a variety of sharpening needs. 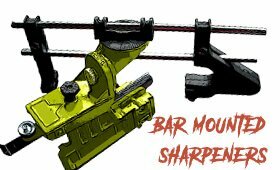 Are you looking for a multifunctional and affordable chainsaw sharpener that is easy to set up? Well the Timber Tuff CS-BWM is an electric chainsaw sharpener that allows you to keep various chainsaws in top condition. This tool sharpens fast as it sharpens booth the gauge and tooth at the same time, saving you a lot of time. The sharpener also comes with a strong motor with speeds of up to 3600 rotation per minute, keeping the chain working as new. Professional woodworker needs to keep their chainsaws working optimally all the time. If you are tired of purchasing sharpeners that fall apart after a few days of use, you should pick this model. This is a heavy-duty model designed to offer handle heavy duty sharpening, keeping all the chainsaws sharps and ready for work. Being one of the best chainsaw chain sharpeners, this tool includes three grinding wheels with thicknesses of 0.25, 0. 325 and 0.125 inches. Additionally, this unit includes a wheel dressing brick as well as a template for wheel contour and deep gauge settings. Although you can use other sharpeners to sharpen chainsaws from various brands, using a sharpener from the same brand enhances the accuracy. This is because manufacturers manufacture tools that match perfectly in terms of tooth angle settings. Although you can use other sharpeners to sharpen your Husqvarna chainsaws, very few of them will match the performance that comes from a tool that is made by the same manufacturer. 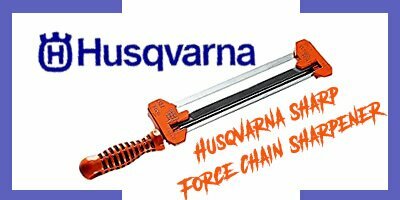 Besides, Husqvarna is popular for durability, high quality, affordability, and convenience. This makes it a perfect choice to sharpen all chainsaws with 3/16 inch chain. However, you might change your chainsaw if it becomes too old to use. Here is our top selected chainsaw chain what you might like. Whether you own a chainsaw for professional use or home use, you need to keep them in top condition. You can do this by regular maintenance such as oiling, replacing the worn out part as well as sharpening the chain. Although you can have professional do the sharpening for you, purchasing the best chainsaw sharpener will save you a lot of money. 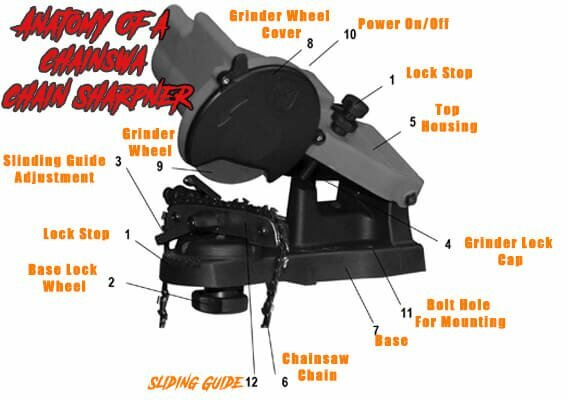 Let us look at the considerations that help you select a chainsaw sharpener that offers you with a professional service. 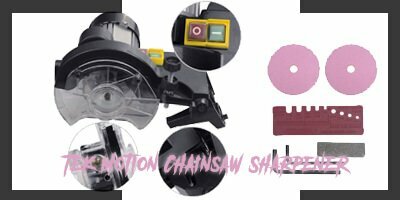 We have various types of chainsaw sharpener. This includes the handheld file, electric sharpeners, and the bar mounted sharpeners. Each of these models has their advantages (to discuss later), so you need to pick the model that suits your need best. The chainsaw sharpeners are constructed using different materials including aluminum, diamond, and other materials. 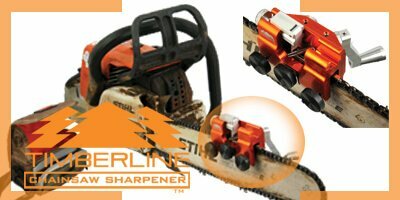 The best chainsaw sharpener is constructed using high-quality materials for enhanced performance and durability. Time is of the essence for everyone, and I doubt if someone who would want to spend a whole day sharpening a chainsaw. To save time and energy, you should go for models that sharpen the chain fast and efficiently. In our case, flexibility refers to the ability to sharpen chains with different chains. Choosing a flexible chainsaw sharpener is essential. This is because you do not have to purchase another sharpener if you have chainsaws with different chain design. Remember purchasing the most expensive model doesn’t mean that you have picked the best chainsaw sharpener.These tools are priced differently depending on the features, quality of materials used, and type. 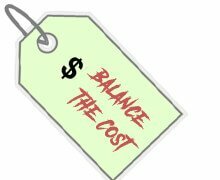 Luckily, there are very models on the market, making it possible for you to find an ideal model that meets your budget. As mentioned earlier there is three type of chainsaw sharpener. These include the handheld file, electric sharpeners and bar mounted sharpeners. Handheld file sharpens the chain by running it over the tip of the chain. They are usually round sharpeners that have a varying diameter that matches the size of the chain you need to sharpen. Although no practice is necessary, users need a certain amount of precision for the best results. These sharpeners are portable, easy to use, and affordable. This is a modern chainsaw, which is powered by electricity. This tool sharpens the chain fast and more efficiently. It is an excellent choice for both professionals and DIYers as they save both time and energy. These sharpeners are not electric but are faster and easier to use than the handheld models. This sharpener secures the chainsaw guide, mounts it on the chainsaw’s bar, and then secures it in place. The user uses control knobs to set the sharpening depth and filing angle. 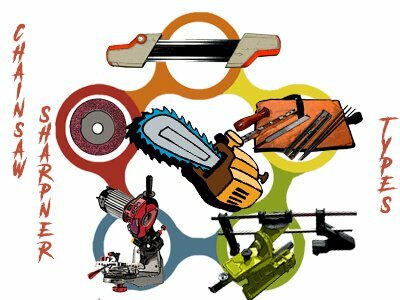 ​How do you sharpen a Chainsaw? Instead of purchasing a new chain when the one you are using becomes dull, sharpening the dull chain will make it as sharp as new. The sharpening process will depend on the type of the sharpener you use. 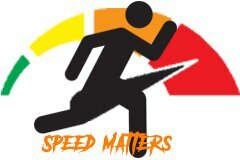 Before you start the exercise, make sure that you have worn protective gear to avoid injuring yourself. You need to have gloves to protect your hands and goggles to protect your eyes. If you are using a bench sharpener, you simply need to set your chainsaw underneath and then turn the motor on. On the other hand, while using a handheld file, you simply need to stroke each tooth as the right angle to sharpen them. The chainsaw sharpeners work differently depending on the type you select. 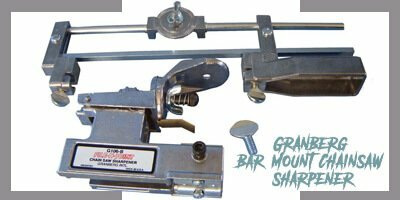 The manual chain sharpener will work by offering you with the correct angle to file. You need to move the file across the guide to sharpen the teeth. 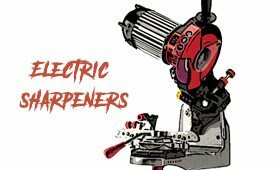 The electric models are considered the best chainsaw sharpeners as they work more accurately, besides being simple and fast to use, the electric models also extends the life of your chain. The best chainsaw chain sharpener helps you to keep your chainsaw in top condition for more efficiency and ease of use. Remember, sharpening your chainsaws regularly will extend their life, reduces the risk of potential limitation, and saves both your time as well as the energy needed to complete a task. Each of the reviewed models is the excellent choice, but before settling on the best, you should consider your needs and pick the model that will fit what you need correctly.